Glencoe Independent Hostel i Glencoe, Skotland: Reservér nu! 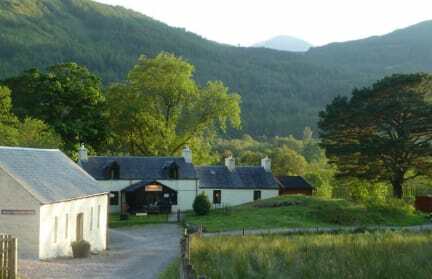 The hostel (standard rooms) is an original highland croft sleeping up to 26, in 4 bedrooms of either 6 or 8 beds. During quieter times you can book sole use of a 6 bedded room for either 2 or 4 people so no sharing! It has a dining room, kitchen and lounge with open log fire. This is available only to guests staying in the hostel building. Hostel rooms are marked 'standard' in the search. THE BUNKHOUSE (basic rooms) is more basic than the hostel although it has recently been refurbished. The bunkhouse sleeps 16 in 1 room of 8 and 2 rooms of 4. It has a central communal sitting/cooking/eating area. The bathroom is accessed externally. Bunkhouse rooms are marked 'basic' in the search. 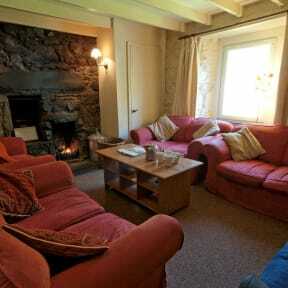 Guests staying in the bunkhouse do not have access to the hostel building with the open fire etc. In both properties bed linen is provided and beds are made for your arrival. Bunkhouse guests do not have use of the hostel facilities and vice versa. We offer a basic continental breakfast for £2.75 which must be booked in advance. We are located 'in the middle of nowhere' between Glencoe Village and the Clachaig Inn. We are easily accessible by car or bike and 1.5 miles from the bus stop in Glencoe Village. You can stock up with food on your way through. Our views are fantastic. We are set in 2 acres of land, surrounded with native woodland, which is home to Roe and Red Deer, wild birds and the occasional Pine Marten. Come rain or shine, the scenery is breathtaking, with views of the ridge and the Pap. If all night partying is your thing you'll find it elsewhere, if you want fantastic scenery and love the outdoors this is the place for you! We have several low level walks locally, plus several 'Munros'. Walking and cycling route advice is readily available. We have a have a purpose built drying room for your kit,. Bike hire is available in the village - why not pre-book it? Just what I needed. Amazing hikes all around me. A little walk to the nearest town/shop. The best pub ever, try the hot chocolate with bailey and also The Scottish cure against colds😍 So much nature 🤤 Made me so damn happy. BUT!! The main building is a lot better than the outer buildings. It has a lounge, a better kitchen, better (no really great) showers and lockers under your bed. My first night in an outer house wasn't awesome. The second night in the main building was pure paradise.